The Flat Belly Diet promises to help you lose up to 2 pounds per week and shrink inches from your midsection. You focus on eating whole, minimally processed foods, especially foods rich in monounsaturated fats. Sassy water, named after one of the diet's authors -- Cynthia Sass -- features prominently in the first four days of the 30-day plan as a way to stay hydrated and maintain focus. It's a combination of mint, ginger, sliced cucumber and water. The first four days of the Flat Belly Diet are focused on getting rid of abdominal bloat and water retention that make you feel puffy and fat. You eat about 1,200 calories daily, with an emphasis on lean proteins -- such as deli turkey and tilapia -- fresh vegetables, whole grains and monounsaturated fats, including sunflower seeds and flaxseed oil. In addition to taking a short walk after every meal to facilitate digestion and eating slowly, you're also to drink 2 liters of sassy water daily to support hydration. 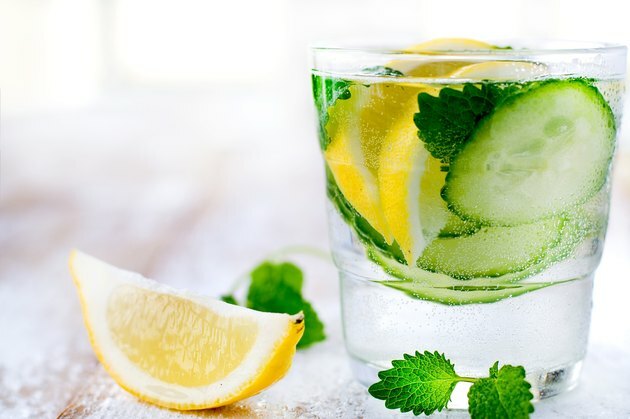 Sassy water consists of about 8 1/2 cups of water mixed with 1 teaspoon of grated, fresh ginger root, cucumber and lemon slices and fresh mint leaves. For four days, you make one entire recipe of the water in the evening and let it sit in the fridge overnight for flavors to blend, then drink it the next day. Being adequately hydrated helps keep bloating and water retention at bay. When your body needs water, it holds onto every bit it has in the cells to maintain your fluid balance. If, however, you drink regularly and show your body water is not in short supply -- you will not retain water and experience bloating. The ginger in the sassy water is said, by Flat Belly Diet authors, to "calm and soothe" your gastrointestinal tract. Ginger does effectively deter nausea and has antioxidant and anti-inflammatory properties. It's been used for hundreds of years as a flavoring and medicinal treatment, for ailments such as colds, arthritis and hypertension. Fresh mint and lemon also aid digestion and discourage stomach bloat. Cucumber and the other ingredients help give the water flavor. The authors of the Flat Belly Diet acknowledge that the first few days of starting a diet, especially one that's restrictive and represents significant change, can be quite challenging. They refer to the sassy water as a symbol of this new lifestyle. Because you make it every day, it serves as a reminder of your commitment to the plan. You sip the water along with each meal for the four-day "Anti-Bloat Jumpstart." Each meal also includes other "mind tricks" to keep you on track and to make meals feel important. Such tricks include eating near a sunny window, arranging fresh cut flowers on your table and using smaller bowls and plates. After you've completed the four-day anti-bloat regimen, your calorie intake increases to about 1,600 calories per day for the next month. You'll still eat plenty of foods that encourage optimal digestion and discourage bloating, including whole grains, lean proteins and fresh produce. Monounsaturated fats continue to be a cornerstone of the plan. Exercise is encouraged, but not required, for the diet to be successful, say the authors. You may continue to drink sassy water if you enjoy it as you shift to the remaining four weeks of the Flat Belly Diet. It adds an insignificant number of calories and may help curb hunger. Nestle: Does Your Weight Change From One Day to the Next?